The balloon flight vouchers makes an ideal gift for Birthdays, Christmas, Anniversaries and other special occasions. 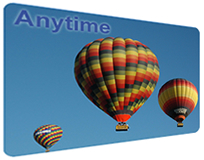 Purchasing a balloon ride voucher online is quick and easy to do. You will receive an instant eVoucher and information pack via email which can be sent direct to the recipient or printed off to give by hand. Flight vouchers are valid for 9 months from the date of purchase and can be redeemed for a flight from any of our flight meeting locations in Cornwall, Devon, Dorset, Somerset or Wiltshire. If you prefer to conduct your business by telephone, then please purchase via our parent company, Aerosaurus Balloons 01404 823102, who will be pleased to provide full telephone support. If you would like to fly in Bristol, Bath or South Wales, please contact our sister company Bailey Balloons. Spread the cost of a hot air balloon ride voucher this Winter by paying in two, interest free, installments instead. Please click on a voucher below for more information on our deposit deal. 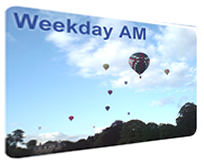 The weekday AM balloon flight voucher enables passenger/s to fly on a weekday morning (excluding bank holidays) from any of our meeting locations within the main flying season April to October. 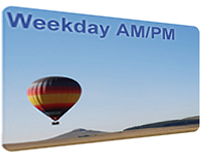 The weekday balloon flight voucher enables passenger/s to fly on a weekday AM or PM (excluding bank holidays) from any of our meeting locations within the main flying season April to October.